Relaxing, rejuvenating, and peaceful—these are the things our guests write most in our journals. Imagine having your own little cottage in the woods: you can build a fire in the fireplace, cook a warm meal in the kitchen, or sit on your porch with a cup of coffee. Take a stroll to our deck and enjoy the sounds of the Swift Brook. A lot like camping without all the work, and better than a stuffy motel, each of our ten cottages are uniquely different. Most offer the comfort of a fireplace, and many have a kitchen and some have screened in porches. All cottages have a bathroom with a stand-up shower (no bathtub), an outdoor charcoal grill, and a picnic table, so you can feel right at home while enjoying what the Mount Washington Valley has to offer. Come and see for yourself why it’s better at the brook! This cottage has a queen bed and futon that opens into a double bed, it is just the right size for a small family or couple. Herbal Nook has a kitchen stocked with all the basics, a refrigerator, stove, coffee maker and toaster. Throw a Frisbee across the large lawn area while barbequing outside on the charcoal grill, or take a stroll down our nature path. The south entrance to the trail is in the woods right behind this cottage. Learn more about Herbal Nook. This cottage is our coziest and sleeps just two people. Although it’s small, the space has been utilized to the fullest. Since renovations, it is one of our most requested. A fireplace with a complementary fire log. This cottage does not have a kitchen, it does have small refrigerator, microwave oven, and a coffeemaker with a k-cup adapter. Hard wired USB chargers on each side of the bed, flat screen tv/dvd, with HDMI ports. Perfect for people on the go. Relax on the screened in porch and enjoy your feathered nest. Learn more about Feathered Nest. This cottage is our most spacious, able to sleep five people, four adults maximum. Mom and Dad can enjoy their queen bed in front of the living room fireplace, while the kids have their own space in a separate room. This room has a double bed and twin bunk beds, this room will not accommodate 4 adults. The kitchen is stocked with all the basic cooking essentials. This kitchen has a refrigerator, stove, microwave, coffee maker and toaster. This cottage has a large 3 season porch, which overlooks the brook, an outdoor charcoal grill and picnic table. Relax with your morning coffee on the swing which also overlooks the brook. Learn more about Birch Hill. Our most romantic cottage is complete with a queen bed, recliner, fireplace, and small kitchen and outdoor grill. Newly renovated with knotty pine and custom built-ins to maximize space. Queen bed, flat screen TV/DVD, a hardwired USB receptacle, separate full kitchen, stocked with everything you should need. The screened in porch has a table and overlooks the brook. This cottage is also near the community fire pit, so if you brought supplies, a s’more is never far out of reach. Learn more about Swift Brook’s Bend. Learn more about Stargazer’s Shire. This romantic cottage can sleep two with a comfortable queen bed overlooking the fireplace. A sunny full kitchen and has a little more room than some cottages. Outdoor charcoal grill and umbrella table, has a view of the brook from the porch. Learn more about Sylvan Overlook. This is another cottage comfortable for a young family of five. There’s a separate bedroom with a double and twin bed, and a tv/dvd. The futon in the living room can be opened into a double bed. Although this cottage has no kitchen, it does come with a full-sized refrigerator, microwave, and coffeemaker. Enjoy lunch on the picnic table right outside. Learn more about Dancing Bear. This newly renovated cottage is ideal for a couple and a big dog or two. Romantic and more spacious than our other couple size cottages, Woodland Grove has a cute little kitchen, a beautiful fireplace, and a screened in porch with a rustic wood table and chairs. Although not near the brook, this cottage allows plenty of privacy. Learn more about Woodland Grove. Perfect for a family, this cottage is closest to the brook with its own private setting. There’s a separate bedroom with a double bed, allowing kids to enjoy their own space with a TV. Parents have the comfort of the fireplace at night, as the queen bed is right in the living room. You could even invite grandma and have the kids sleep on the double futon in the living room. With a roomy kitchen a few steps away, you can sneak a midnight snack without waking the kids! Learn more about Moonlight Hideaway. Although this cottage is near the road, many of our guests request it again and again. With a spacious kitchen/living room, this cottage has a futon that opens into a double bed, and a bedroom with a queen and day bed, making Twigstone comfortable for a young family of six. Warm up on the futon before the cast iron gas stove. Picnic table and charcoal grill, this cottage is located next to the playground. 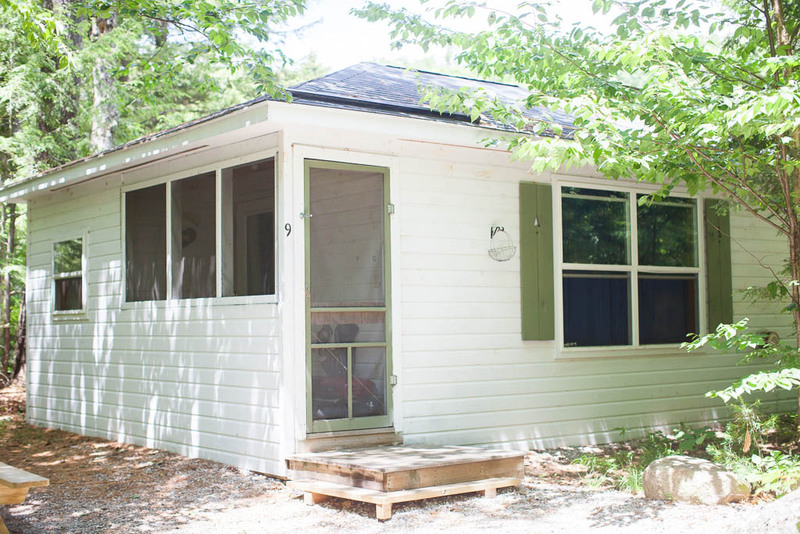 Winter or summer, this cottage is perfect for your White Mountain getaway!